Whether you have classic car or an RV you need to protect and store in the Redlands area, we recommend you consider the advantages of large warehouse storage for cars, boats, and personal property. At Vines Storage, we provide a wide range of options for individuals ready to protect their investments. From small 5' x 5' storage units to larger 20' x 20' spaces, we have a solution for everyone! At Vines Storage, we encourage customers to take advantage of the large warehouse storage available. We allow individuals to lease out closed units to cover and protect their cars, as well as open parking spaces which provide ample space for your vehicles. Many individuals who obtain storage units from us enjoy the large warehouse space which allows for more vertical storage than any other storage facility in Redlands area. Vines Storage also provides a number of amenities that are unsurpassed by other area facilities including 24 hour surveillance and monitoring, convenient access hours, and a staff that cares about protecting your property. We recommend customers strongly consider our facility for the added amenities and convenience of storing their goods. It's a good idea to store a classic care in a safe and secure storage facility. Classic cars can deplete greatly in value when left outdoors, and can also invite intruders to your home. It can result in negative effects due to leaving them out in the elements where snow and rain can dramatically reduce the beauty and shine of the paint job and can even seep into the car and affect upholstery. You spent a lot of money investing in your classic car that it seems absurd to leave it where it can be harmed and damaged. 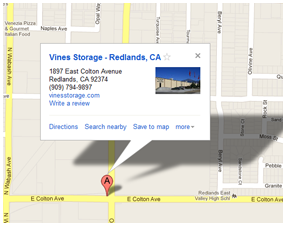 If you are in the Redlands area and have been wondering whether large warehouse storage for cars is best for you, contact the team of Vines Storage and come in to take a personal tour of our warehouse facility. We recommend individuals take the time to learn more about their storage options to make an educated decision as to which type of unit is best for their specific needs and budget. We also provide flexible leasing options and convenient access times to meet your schedule.